George Graham Reviews Bela Fleck's "The Bluegrass Sessions"
The pleasures of good bluegrass music are not to be underestimated, especially instrumental bluegrass. In these days of pretentious in-your-face alternative rock, pretentious teenage pop groups, pretentious country music stars, pretentious pseudo-Latin hits and even roots rock bands that sound so sincere that it borders on the pretentious, hearing one of the great American music forms played by a bunch of musicians using instruments that don't plug in, can really be a breath of fresh air. Especially when those musicians are some of the best around and are doing what they do for the love and enthusiasm of the music and having an infectiously great time in the process. I am reminded of this by a CD that combines some of the world's finest living bluegrass musicians in a recording that is not only stellar bluegrass, but is just great music from any objective perspective. It's the newest release by the prolific banjo luminary Béla Fleck called The Bluegrass Sessions, Tales from the Acoustic Planet Volume 2, and it just doesn't get much better than this. These days Béla Fleck is probably better known among the general public for his group the Flecktones, which combines electric and electronic instrumentation in a style that ranges from funky to Celtic. They have been attracting a suprisingly wide variety of audiences from jazz fans to Deadheads and Phish-heads. The peripatetic Flecktones have also taken their genre-shattering music to audiences as far away as Mongolia and Nepal. But, if you play banjo, chances are you have some bluegrass in your background, and Béla Fleck has won so many prizes in bluegrass banjo polls that long ago he was retired from the competitions. Fleck has an interesting background. A native New Yorker, he attended the City's High School of Music and Art celebrated in the musical "Fame." Fleck writes in the liner notes to The Bluegrass Sessions that he was five or six years old, living in New York City, when the sound of the banjo hit him "like a ton of bricks," and changed his life forever. He was studying the instrument seriously by age 15, with such masters as Tony Trischka, and while still in his teens he was being acclaimed as one of the new sensations on his instrument in bluegrass circles. He recorded his first album at age 19, in the company of such people as Sam Bush and Mark Schatz, and plunged immediately into the burgeoning so-called New Acoustic Music movement, combining the musical sophistication of jazz with bluegrass instrumentation. He did a still-remarkable version of Chick Corea's classic latin-influenced jazz composition Spain on that first LP. He was a member of a fine Boston area bluegrass band Tasty Licks, and recorded two albums with them, while he was studying jazz in the Bay State. Throughout the 1980s, Fleck recorded a series of outstanding solo albums, and for close to a decade was also a member of New Grass Revival, headed by Sam Bush. That group came close to having a country hit or two, but never let that detract from their eclecticism, which ranged from reggae to R&B. Settling in Nashville, Fleck also became much in demand as a studio musician, recording with people like Loretta Lynn, Nanci Griffith and even Garth Brooks. Throughout this time, Fleck had always been honing his composing ability, creating fascinating music that reflected his wide-ranging interests, and perhaps most notably, was music that did not have to be played on the banjo to sound good. As a kind of one-off project for a Public Radio/TV series, Fleck put together an eclectic band with an bass player named Victor Wooten, who auditioned over the phone and whose bass style had been influenced by Fleck's approach to the banjo. That was the start of the Flecktones, with they have become one of the more unlikely success stories in the music world these days -- an electric jazz-rock-world-funky-bluesy fusion band led by a banjo player. Just before Fleck formed the Flecktones in 1989, he was involved with an all-star New Acoustic album called The Telluride Sessions with mandolinist Sam Bush, fiddler extraordinare Mark O'Connor, bluegrass and classical bassist Edgar Meyer, and Dobro master Jerry Douglas. They called themselves Strength in Numbers, and the album they made still ranks as one of the finest in the history of the New Acoustic genre. Now 11 years later, The Bluegrass Sessions recreates the spirit of The Telluride Sessions, with three of the participants, Fleck, Bush and Douglas, regrouping along with Stuart Duncan on fiddle, Fleck's old colleague Mark Schatz on bass, and my own favorite bluegrass guitarist Tony Rice. They are also joined by some notable guests including bluegrass banjo pioneer Earl Scruggs, plus John Hartford and Nashville fiddle great Vassar Clements. It's interesting that despite their stellar reputation and friendship, this combination of musicians had not operated as group before, and thought there were various permutations of these players on previous albums, this is only the second second whole album I have heard with Béla Fleck and Tony Rice together. They represent probably the two most impressive and eclectic players on their respective instruments. I had always wished that Rice would have been on the Telluride Sessions LP. But despite the fact that this group as such is a new one, all these musicians are on the same wavelength, combining breathtaking virtuosity with a kind of joyful spirit of musical exploration and curiosity to go just about anywhere stylistically. 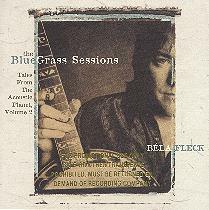 Unlike The Telluride Sessions 11 years ago, on which all the participants contributed to the composing, The Bluegrass Sessions is also very much a showcase for Fleck's compositions. With the exception of a couple of traditional or old-time pieces, Fleck wrote all the music, and he again shows that he is as worthy a composer as he is a banjo player. The music can sometimes sound traditional, or jump into a jazz style with complex harmonies and changing time signatures, or can be pretty and contemplative. Fleck calls this a bluegrass album, but the music is quite wide-ranging, so there are still some died-in-the-wool traditionalists who are likely to complain, even with Earl Scruggs on this album. Béla Fleck's new CD The Bluegrass Sessions: Tales from the Acoustic Planet Volume 2 is a sequel to two of Fleck's past acoustic recordings -- his Tales from the Acoustic Planet Volume 1 from 1997, which put Fleck in contact with a lot of musicians from various other genres, and the now out-of-print 1988 album The Telluride Sessions, which featured three of the same musicians as the core of this all-star group. Hearing these amazing players together again is a real treat, especially the combination of Fleck and Tony Rice -- two remarkably compatible musicians who had, to my knowledge, done only one full album 0together previously. And once again, Fleck reminds us why he is not only the most acclaimed banjo player of the current generation, and that he is an exceptionally fine composer, writing music that combines attractive melodies with an intriguing set of influences, in a manner that would sound good on almost any instrumentation. The result is a recording that makes for exceptional listening. For fans of contemporary bluegrass, it's a kind of dream-team event, and for fans of Fleck's electric Flecktones band, it's a chance to hear him going back to his acoustic roots. Sonically, this album is a class act. There are jokes among musicians about how limited the dynamic range of the banjo is, but Fleck over the years has insisted that his recordings, both with the Flecktones and other groups, be free from the heavy compression that is so depressingly common on major-label CDs. So the engineering by Bill VornDick, with whom Fleck has worked over the years, captures the life of the vintage acoustic instruments played by this remarkable group. Even if you are not a fan of bluegrass, The Bluegrass Sessions may well make you into one. It's a wonderful change from the mindless similarity of commercial pop. It's also exceptional music played by exceptional musicians, irrespective of genre.